Melanoma is notorious for its resistance to cytotoxic and radiation therapy, and patients with advanced melanoma has a poor prognosis. Despite development of new cytotoxic drugs, immunotherapies, and treatment strategies combining the two, overall survival of patients with metastatic melanoma has not improved significantly. Recent studies provide a modicum of optimism regarding our understanding of the biology of melanoma and potentially regarding targeted therapy for this disease. Genomic mutations in N-Ras, BRaf, and PTEN have demonstrated intimate involvement in the progression, invasion,and survival of neoplastic cells in most cutaneous melanomas. An increasing number ofdrugs inhibit the signal transduction pathways activated by these aberrations, and recent clinical studies have shown cautiously promising responses to these drugs. Many of these studies are also elucidating the role of angiogenesis and immunoregulation in melanoma, opening the door to a wide variety of new strategies for tumor environment modulation and immunostimulation for more effective melanoma therapy. 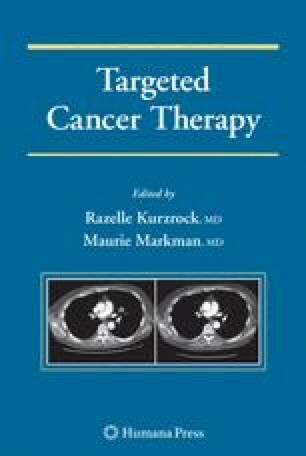 Because of the complicated signal transduction pathways in melanoma cells and the complex interactions of these tumors with the surrounding environment and immune system, combining these drugs with other targeted therapies, cytotoxic agents, or immunotherapies will likely be required for successful treatment of melanoma.